At a time when workers’ pay and benefits have stagnated, federal employees’ average compensation has grown to more than double what private sector workers earn, a USA TODAY analysis finds. But, you like this. 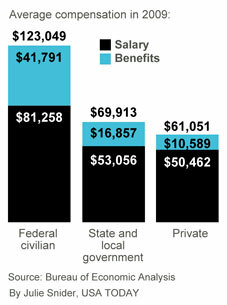 You want government and state workers to make twice as much as you. At least, that’s what the state-run media is trying to sell you today. Americans strongly oppose laws taking away the collective bargaining power of public employee unions, according to a new USA TODAY/Gallup Poll. The poll found 61% would oppose a law in their state similar to such a proposal in Wisconsin, compared with 33% who would favor such a law. The only way government employees can continue to bilk the public is through lucrative union contracts. It’s also a great way for the far left to move taxpayer dollars from the producers to the democrat party. No wonder the media is fighting so hard for these Wisconsin unions. UPDATE: Tea Party Leaders urge Governor Scott Walker to STAND STRONG.